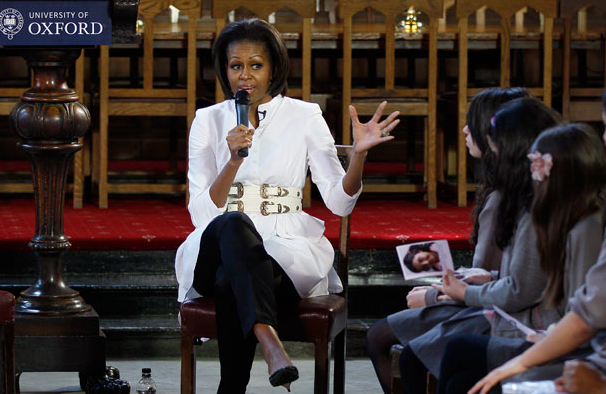 Dressed in a white tunic, black pants and a major gold belt – together with her black eye-liner, looking just a little bit 60s – Michelle Obama offered some career and relationship wisdom to a group of schoolgirls from inner city London (just up the road from here) who were visiting Oxford University. Who wouldn't want this wonderful woman on speed dial for all of life's crises? “People sometimes questioned whether someone with my background could succeed at an elite university. And when I was accepted at one of those universities, I had all kinds of worries and fears and doubts. I worried that I wouldn’t be as well prepared as students who had come from more privileged families; I worried that I wouldn’t fit it somewhere so different from where I’d grown up. “I knew he was a special person. And it had nothing to do with his education, it had nothing to do with his potential. 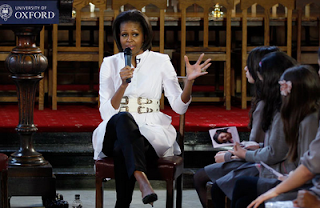 There are a lot of women who [to tick] the boxes – did he go to the right school? What is his income? It was none of that. It was how he felt about his mother. The love that he felt for his mother. His relationship to women. His work ethic. "We worked together in a firm. He did his work, and he was good. And he was smart. And I liked that. And he was low key, and he wasn’t impressed with himself. And he was funny. And we joked a lot. And he loved his little sister. "And he was a community organiser. I really respected that. Here we are in a big law firm, right, and everybody was pushing to make money. He was one of the smartest students at Harvard Law School, one of the smartest associates in our firm. He had the chance to clerk for the Supreme Court. And I thought – well, you’re definitely gonna do that, right? Only a few people have the chance to do that. "And he was like, nah, not really. I think I can do more work working with folks in churches. And I was like, whoa, that’s different. And he meant it. It wasn’t a line, he wasn’t trying to impress me. It was those kind of values that made me think, you don’t meet people like that often. And when you couple that with talent and, he’s cute... You know, I always thought he would ... be useful [she laughs]. "But I had no idea he would be President. I didn’t think he was going to be President until the night we were standing on the stage and he actually won, you know. I was like, God, whoa, you won.